The theme of the March 2nd Edinburgh RIC meeting was chosen in recognition of International Women's Day (IWD), which falls on 8th March. Linda Rodgers and Cat Grant spoke about the history of IWD, and Eileen Cook spoke about the work of the Abortion Rights campaign. The following accounts are made on the basis of notes taken during the meeting, and do not purport to convey the full value of the very interesting and informative contributions. My apologies if I have misunderstood or distorted anything. Linda opened by saying how impressive and heartening it had been to see so many women active in the Indy campaign, and visible on the streets and in the media. The film Selma, which she had recently seen and found moving, was also interesting - and to be commended - in the way it had given women their due for their role in organising the civil rights movement in the USA. All too often the images of leaders and activists in great struggles had been those of men, leaving women invisible. IWD's role was not just to celebrate the role of women, but to inspire. It was set up in the aftermath of a series of strikes by women garment workers in the USA in the early 20th century, and specifically that of 8th March 1908 in New York. These origins were largely forgotten now, but these strikes had a big impact at the time not only across the USA but in Europe, where there was a rising ferment of socialist ideas. There has been some progress towards some of these demands but much yet to be fought for. For example, violence against women is still widespread; and the austerity cuts to public services strike especially hard on women. Since the 1980s, there has been a tendency to downplay demands specifically or specially affecting women, with many people on the left tending to believe that "we are all equal now" and that there are no real women's issues, just issues of class. But there are always issues which critically and disproportionately affect women: to take just a couple of examples currently live, the issue of 50:50 representation in positions of power and that of moves against the right to choose under the guise of guarding against gender-selective abortion. IWD should be used as a spur to revive the demandto recognise, even or especially in groups and organisations on the left, the degree of privilege that men enjoy and through which women's issues get marginalised. Cat filled in more of the history of IWD. The original strikes were of women and child workers, and were "illegal" in the sense that the participants had no permission to march in the streets. Their demands were such things as a shorter working week, and an end to child labour. It is a matter of shame that the demonstrations were attacked by male workers and trade union members. A later strike in Lawrence (1912), involving mainly women but men as well, drew threats from employers and authorities to take workers' children away. Hundreds of children were sent away to sympathisers elsewhere in the USA and Canada; on one occasions women and children waiting to depart at the rail stations were attacked by police and imprisoned. Solidarity was not universal: Elizabeth Gurney Flynn, a prominent organiser with the IWW who supported the strike, spoke at a meeting while heavily pregnant and was stoned by men in the crowd. By August 1910, following the New York strike, support had grown in Europe and from there the proposal was made that there should be an IWD on the anniversary of that strike. On 8th March 1911 there were massive demonstrations in Germany, Denmark, France and elsewhere (but not such a positive response in Britain). The demonstrations made demands for women's suffrage and for wider emancipation of women, and associated these with socialist programmes. It should be remembered that the position of women in the early 20th century was very oppressed: for example it was illegal in Germany for a woman to belong to any political organisation including a trade union. But the oppression has by no means been ended. Today, women still find attitudes within trade unions difficult: very recently, male trade union colleagues have been heard to say such things as that women would prefer their husbands to have more pay than to have equal pay themselves. This when the Equal Pay Act has been law since 1971; there are still fights to get it implemented in practice. The greatest IWD of all was most certainly in Russia, in 1917, on 23rd February in the old Russian calendar. The official version of events is that no strikes had been organised that day, only a series of public meetings around the theme of IWD. But 90,000 workers did strike, including 20,000 women, and double the number the following day. Clearly there had indeed been someone organising: this "spontaneity" was obviously, in fact, orchestrated by the women. This has never been recognised by official Soviet histories - but the Russian (February) Revolution did, in fact, start on International Women's Day. Very quickly after the revolution women made and achieved demands for the right to abortion and the right to divorce. There was no right to "family planning" in the UK at the time, and a talk by Alexandra Kollontai (the first woman member of the Central Commitee of the Bolshevik Party) in London drew 600 women, who (it is said) probably mainly wanted to find about how to access contraception. In this era, IWD was widely seen as being associated with the trade union and socialist movements. It took until 1977 for it to be recognised by the UN, and in the 1970s and 1980s it was still possible to get support from bodies like local authorities to hold events. Since then, though, it has tended to lose some of its edge, and the women's movement generally to be associated with bland ideas such as encouraging aromatherapy (!). The IWD itself tended to be talked about as something from the past. This should change. Women should take a page from the IWDs of the past, and become more ferocious in their demands. There is still much to be ferocious about. Even at a recent Women for Indy event, MSPs had spoken to their female audience as "you", rather than "we". There was a speaker from the police (very good, too) but none from the trade unions. 50:50 is still being talked about (though the SSP made it a reality 13 years ago). Women still experience widespread violence in the street and in the home. Trade unions fail to pursue the issue of equal pay with due vigour; many of the cases taken through the courts are being won by privatelawyers. Time to get ferocious again. Eileen spoke about the work of the Abortion Rights Campaign, especially in relation to two current issues. The first issue concerned recent attempts to amend the Abortion Act (AA) of 1967, which applies in England, Wales and Scotland but not Northern Ireland, where abortion is still illegal. The AA is a very imperfect measure. In no way does it represent a woman's "right to choose": abortion is very heavily regulated, much more so than any other medical procedure. It is the only medical procedure that has to be approved by two doctors; and the only one that can only be carried out in certain strictly defined circumstances, specified in the Act. This makes it relatively easy for anti-abortion campaigns to seek to have more restrictions added, usually after some sensational story, inflated in the media, about some alleged abuse. Most recently the story - started in the Telegraph, on the basis of suspect data - has been that of gender-selective abortion of female foetuses. An amendment to the Act was put forward to outlaw abortion on the grounds of gender - an unnecessary addition in any case because, not being included in the list of grounds on which abortion can be permitted, it is already illegal. Fortunately the amendment was defeated, but such attempts are made every so often and there will be others coming along soon. Getting an abortion is still something of a lottery. For example, abortion is much more difficult in the English Midlands, where some 50% of abortions are carried out privately, than in Scotland where the figure is 2%. In those states of the USA where abortion has been made illegal, women increasingly turn to the internet to get dubious drugs: the modern version of the dangerous back-street abortion. The campaign wants straight women's choice. The second issue concerned devolution of powers to regulate abortion to Scotland. It was still the one health power which had not been devolved, because of concerns that religious passions, supposed to run higher in Scotland than in England, might lead to retrogressive legislation, even ending up like Northern Ireland. The Smith Commission had left it up in the air, probably as a result of Labour pressure using similar arguments. The campaign was still pressing for it to be devolved. 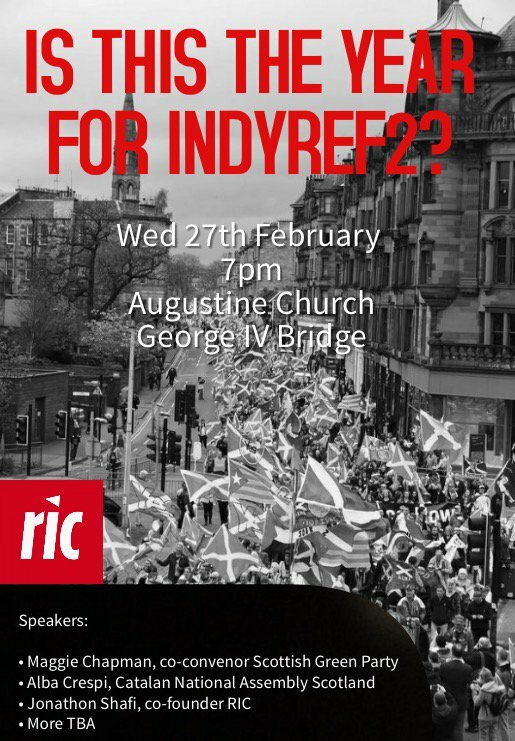 The next meeting of the Edinburgh branch of the campaign would be on Tuesday 10th March. On the last Saturday in April there was likely to be a SPUC demonstration in Lothian Road (Mandela Square) and, as in previous years, the campaign would mount a countervailing presence outside the Usher Hall. Supporters welcome. The meeting then broke up into small groups to discuss issues arising from the presentations. - there was active discussion and some varied opinions about the role of religion in oppressing women; one view was that religion was to blame for much of the harm, while another was that religion was in effect a tool to bolster male dominance rather than its source. - there had been a movement, unsuccessful, to call for a general women's strike on IWD this year; but 2017 would be the centenary of the Russian Revolution and this would be a good date to aim for making this a reality.